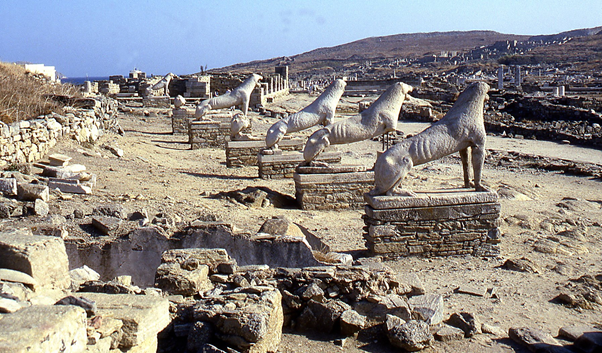 Delos, although one of the smallest Aegean islands (6.85 sq. Km. ), Was in ancient times the most famous and the most sacred of all the islands because, according to myth, it was the birthplace of Apollo, the god of its light day and Artemis, the goddess of night light - the light for the Greeks was always precious. Zeus then created a circle of islands around Delos as a tribute to his children. Since the end of the 19th century, when the systematic archaeological excavation started, the trips over to the island have become more frequent. Rowing boats, belouthes and caiques of the past have been replaced, today, with the contemporary and totally safe small vessels which continue to provide the transportation service between cosmopolitan Mykonos and the historical, archaeological island of Delos. During the summer, hundreds of tourists from picturesque Mykonos and the nearby islands visit the birthplace of two of the most important ancient Greek gods, Apollo and Artemis and so live a unique experience. An entire ancient city awaits them when they reach the sacred island. The ancient homes, “guest quarters”, market places, public squares and buildings, the sanctuaries and temples dedicated to the ancient gods and every other facility which a well-organized city had to offer, come to life before your eyes and fill you with admiration and awe. The Museum, with its numerous exhibits from all the historical periods which are represented on the island, is ready to amaze anyone who visits it. Last of all, next to the Museum there is a coffee shop, where one can take a break and relax. We can organize upon request your transportation and guided tour to the island. Breathe freely under the water… Visit the unknown world within the depths of the ocean. Enjoy the beauty of the seabed with your own eyes. 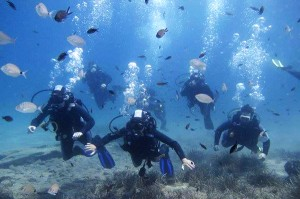 Our experienced partners will lead you safely to unforgettable diving experiences.